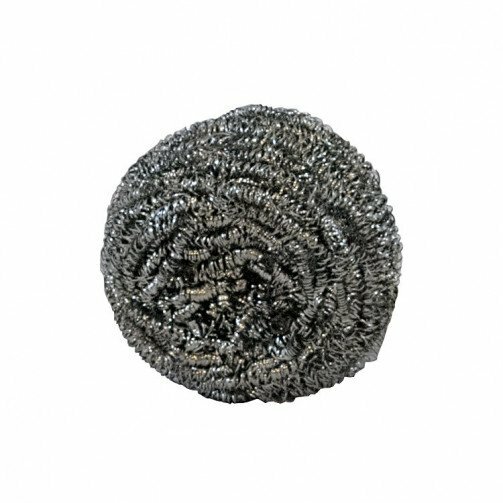 Stainless steel scourers - pack of 10. Ideal for shifting burnt on food and grease from pans, cooking implements and other kitchen items. Being made from stainless steel mesh this scourer is rust proof and can be washed out numerous times and reused once the food and dirt particles are removed, giving the scourer a longer life than soap filled scouring pads. Not for use on non-stick pans, plastic bathroom furniture, enamel or any other delicate surfaces. It is advisable that the user wears gloves when using these stainless steel scourers. Useful for all tough cleaning jobs anywhere in the home and all catering areas.